Skype Message Sender - the unique English skype message sender, let you send message to the filtered hundren millions skype online users worldwide. 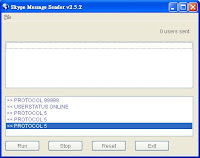 The most powerful message sender - this highly marketing tool is for webmasters, marketing companies and if you just want to chat with the online global skype users. Webmasters can send your site's link and messages to your target countries, languages and gender with a few clicks.